Leonard: Shut up Howard! Sheldon, we have to do this. Sheldon: No we don’t. We have to take in nourishment, expel waste, and inhale enough oxygen to keep our cells from dying. Everything else is optional. While Sheldon is making an argument for getting out of going to give a presentation, he also makes a valid point that there really isn’t anything we have to do. I often find the people I speak with tell me they (have) to do this or they have to do that, without realizing what it is that they’re saying – without realizing what it is that they’re committing themselves to. Remember I wrote about the importance of our words on ourselves and on each other. Think about the way your biology would respond to feeling required to do something, when it really wasn’t as dire as all that. Really, do you really have to go to the next Rihanna concert, Usher concert, Taylor Swift concert, or Katy Perry concert? Will your life be pointless if you don’t go? I can understand really wanting to do something, but we now know the importance of our words on our biology, why would we unnecessarily over-stress the body with this over-the-top language? I can understand that nobody’s perfect and from time-to-time, (like today), even I slip up and use language that I have been socialized into using. I’d like to think that most times, I catch it, but I’m fairly certain that there are times when I don’t. Even though I’ve read all that I’ve read on this subject, I still flub simple things like (having) to do something versus (wanting) to do something. I know that I may sound trivial, but while this difference seems minute, the subtle shift for your biology is tremendous. 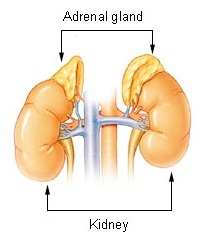 Let’s think of it this way… Your adrenals are superior to [directly above] your kidneys. One of the main functions of your adrenals is to secrete hormones in response to stress. So, when your body is stressed (as interpreted by your brain), the pituitary gland sends a message to the adrenals to produce cortisol [increases blood sugar and quiets the immune system by “muting” the white blood cells] and epinephrine [increases heart rate and prepares for fight-or-flight response] also known as adrenaline. As we learned from Bruce Lipton’s “The Biology of Belief,” when our cells are ‘preparing for battle,’ they can’t be simultaneously taking in nutrients and growing. So, the next time you think you have to do something, remember what that will do to your adrenals and the overall health of your body. This entry was posted in Health, Philosophy and tagged Bruce Lipton, Concert, Sheldon Cooper, The Big Bang Theory, Words. Bookmark the permalink. Keep doing what your partner say's, some day you may walk on water. … without some sort of illusion at play (invisible plank or glass blocks).